Pastor Myles Munroe passed away in a tragic accident, involving the death of nine people, including Dr Myles Munroe and his wife Ruth. Personally, I am not familiar with much of his teachings or ministry. But I have tremendous respect for a man who has dedicated himself to ministering to others. Even if we may disagree on many matters, he did great work with what he understood and believed. But all too often, the dark reality of Christianity has raised it’s head. Our fruit of reducing the Gospel to a “get out of hell free” card, has spawned a mountain of heresy hunters seeking to spread their gnostic heresy of salvation by doctrine. And they have taken sight on Myles Munroe and his teachings. Many have concluded, that for no other reason apart from they do not agree with him, or do not understand him, they see the need to declare him a false teacher, and some have gone so far as to say he’s in hell. Thanks to these Gnostic Christians, they have once again tarnished the Good News of Jesus Christ with their narrow mindedness. These heresy hunters, so blinded by the deceitfulness of sin, attack one of our own. In so doing, they show the world that Christianity is not about love and acceptance. But rather it’s a shallow, hypocritical religion. Did Myles Munroe deny Christ in his preaching? So what has all these heretic hunters up in arms over Myles Munroe? They believe that Myles Munroe denies Christ in his preaching, simply because he has been quoted as saying, “Our Good News is not About Calvary. In other teachings, Myles Munroe talks about how we do not share about the blood of Jesus with unbelievers, because they do not understand our Christian culture. Rather we should share about the inheritance we have in the Kingdom. This also drives our heresy hunters crazy, because they are so myopic in their vision. Unless something explicitly has the name Jesus, they wouldn’t know what anyone is talking about. The irony of course, is that Myles Munroe NEVER suggested that the Message stopped there. Neither does he suggest that we never talk about Jesus. He always said, that we talk about the Kingdom FIRST, and THEN talk about how this was achieved in the Finished work of Jesus. But the Heresy Hunters have usually switched off the videos before they can hear that part. And therefore it never gets mentioned. If you listened to the Sermon above, you will hear at the 25th minute the part where Myles Munroe says that the second part of evangelism is to share the Lord Jesus, after we share about the Good News. There is no denial of Jesus Christ in Myles Munroe’s preaching. That only exists in the minds of heresy hunters who don’t listen. Myles Munroe, in my opinion, is absolutely correct. Contrary to the heresy hunters, he does not deny Jesus. Rather he does exactly what Paul did when talking to the Athenian pagans on Mar’s Hill. Paul used their superstitions and poets to share the Good news of our Inclusion into the Family of God. In that entire sermon Acts 17:16-34, Paul never mentions the name of Jesus. Does that mean Paul has denied Christ? Does that mean Paul is a False Teacher? No, of course not. Paul is wise in using what the culture was familiar with to draw their interest, where some men inquired more about these matters (Acts 17:34). It is in those settings, we can assume Paul shared about Jesus Christ. This kind of reaction is common among the immature believers who need everything spelt out to them. They are babes, unskilled in the word of righteousness. Therefore they cannot discern good and evil, without someone spelling it out to them plainly in simple words. Hebrews 5:14 But strong meat [Maturity] belongeth to them that are of full age, even those who by reason of use have their senses exercised to discern both good and evil. I remember the first time I told someone that Jesus didn’t preach the Born Again message as we preach it. They slammed me for it, and demonized me. But the truth was evident, Jesus never went around teaching that he died and rose again on the third day. As with them, and with many today who have fallen for the gnostic heresy of salvation by doctrine, they are so afraid of going to hell by getting teachings wrong, they attack anything different. And unfortunately Myles Munroe’s legacy and family must endure the fruits of that fear from the very ones who claim to be our brothers and sisters. Amen! Amen! Amen! IT IS ALL ABOUT JESUS CHRIST AND NOTHING LESS! Don’t you think that it would be a good idea to familiarize yourself with a person’s teachings and believes before you defend them? Anyway to address just this one point that your brought up, the good news of the bible is that Jesus died, was buried and that He was resurrected. Putting the kingdom message before the work of Christ is like putting the cart before the horse. Jesus Christ is The Kingdom. What He came and achieved here on earth is our passage way into the kingdom. Quoting you again, “In other teachings, Myles Munroe talks about how we do not share about the Blood Of Jesus with unbelievers,” The Blood of Jesus Christ or His death was not only for believers but He died for the sins of the whole world. The work (not works) of the ministry is to believe in Jesus Christ. And to believe in Jesus Christ is to believe in His death, burial and resurrection. This should be our starting point, with unbelievers and with believers. Fix our eyes on Jesus Christ……..
Not being familiar with much of his teaching, is not the same thing as not being familiar with the evidence used to support the accusations that he doesn’t preach Jesus. What is circulating, with videos like the ones posted as “evidence” of his false teaching, I am very familiar with. Which is why I am commenting on this topic, as it seems to be the only issues used to denounce Myles Munroe that has surfaced. No one is suggesting we do not discuss the impact of what the Cross has accomplished. Myles Munroe never suggested that, neither did I. But you are confusing evangelism to unbelievers with believers going to do the works of Ministry. An unbelievers is not doing the works of ministry, so the message would be different for them to believe first, before they can go and do the works. We cannot expect unbelievers to “fix their eyes on Jesus,” when they don’t even believe in him yet. That’s where you’re getting confused. You’re quoting verses out of context for the wrong audience. The issues raised are speaking to unbelievers. That is what I’m addressing, and it is what Myles Munroe, and the Apostle Paul suggested in their Preaching. They preach the New Covenant/the Kingdom, and then explained what Jesus did to accomplish this Good News, to bring people to faith. It is only AFTER they believed, they can go and do the works as explained in the verse you quoted. However you want to preach it, either Jesus only, Kingdom Message First then Jesus finished work, doesn’t matter as Jesus is preached in both ways, and neither way make anyone a false teacher. Brook thanks for your response. If you take the time to listen to Myles Munroe’s other teachings maybe you would understand what I was trying to say. Dr. Myles like other word of faith teachers have elevated mankind to a near God status and have down graded God to a human status. For example he is very strong on a teaching that God cannot do anything on earth unless we give Him permission. In the video you posted above, Dr. Myles says that Jesus is the door. Well the Jesus Christ of the bible that I know is the door, the house and the furniture in the house. (using that analogy). He is everything. I don’t refute the teaching of the Kingdom but the Kingdom of God is Jesus Christ. He is The way and He is The life. Quoting you from your response above, “They preach the New Covenant/the Kingdom, and then explained what Jesus did to accomplish this Good News, to bring people to faith.” First of the Good News is the message of the death, burial and resurrection of Jesus Christ. It is Good News because it was an answer to the bad news… The bad news is that we were born into this world in Adam, Spiritually dead to our God. Because Adam sinned, we all sinned and thus we were born without the life of God in us. Jesus Christ came to fulfill, among other things, these two issues; sin and death. He died to take away the sin that Adam brought into this world and He was resurrected to give us, (those who will accept in faith) the life that we lost in Adam. That is the Good News. The New Covenant as explained in Hebrews 8 is the inheritance that we (believers) now possess because of what Jesus Christ did. The “Kingdom of God” is only a Kingdom because the King (Jesus Christ) is there. If you are in Christ and Christ is in you then the Kingdom of God is in you. ?.”. Tell them about d kingdom and how to b partakers of the kingdom which is through Christ….there’s no way u would talk about out d kingdom without mentioning Christ…that’s d truth..
Bro. Tom thanks for schooling me. To you what is the gospel that Paul is not ashamed of? What is the gospel that is the power of God for salvation? In another letter he says that God did not send him to baptized but to preach the gospel not with words of eloquent wisdom, lest the cross of Christ be emptied of its power. Just in case we are wondering what that gospel is, Paul, the apostle to the gentiles, tells us in his letter to the Corinthians. Now I would remind you, brothers, of the gospel I preached to you, which you received, in which you stand, and by which you are being saved, if you hold fast to the word I preached to you unless you believed in vain. So my brother, are you saying that I should now exchange the gospel that Paul preached for one that Dr. Myles preached? Roger, no one is denouncing Myles Munroe for his other teachings. The Heresy hunters are claiming he doesn’t preach Jesus. That is the focus of my message, and I see no need to rabbit trail down every other teaching. Jesus died for our bad theology, and frankly, with 41,000 denominations, we should have a little humility in the areas from which we disagree. Does that mean that we literally become God? No, it means that we are in Union with God and there is no separation. More Specifically, we are Like Jesus Christ, which is God in Union with our Humanity. The Apostle John said it this way, “…As He [Jesus Christ] Is, So are we in this world (1 John 4:17c). The early church understood Jesus Christ is the Union between God and Humanity. That there will forever be a Human in the Godhead, and that God has chosen not to be God apart from Humanity. While people think these concepts may be blasphemous, they are actually very orthodox and core to the early Trinitarian theology. While I may disagree with your Gnostic and Dualistic thinking of the world, the Kingdom and the Good News, that doesn’t mean I’m going to label you a false teacher. I simply disagree with your modern interpretation. And as much as we can spend the next few years comparing interpretations, that in no way will justify the unmerited attacks on Myles Munroe. Why the name calling? I thought we were exchanging our thoughts as brothers in Christ? Jesus taught the kingdom of God, and demonstrated it’s availability through his works. Now to your point of saying we need to teach unbelievers what Jesus did is true, and in being said Myles is say present the Kingdom, like Jesus and Paul did, then present the way to get in. I don’t see anything wrong with that simply because at the end of the day, even with that method Christ is still shown to be Lord, King, and the only way by which anyone can experience the kingdom. Jesus is the way..The truth and the life…The way to the kingdom is Jesus..u can’t understand the kingdom and it’s purpose unless u understand Jesus. .For God so loved the world that he gave his only begotten son..that whosoever believes in him shall not perish..but have everlasting life..everlasting life is in the Kingdom..so u can’t make the kingdom. .without first believing that Jesus christ came,died and washed away our sins With his blood..no one can approach the. Kingdom or God except through Jesus..that’s why we pray in his name..and he came in human form to suffer not for the believers..but for the unbelievers. .I don’t no if the aligations are true..but I’m just commenting. .I believe as Christians the news on our lips must be Jesus. .That’s why we are Christians. Meaning christ like. .u must not dangle anything to anyone to make them accept Jesus. .
That is the good news we have. That Jesus died on the cross and after three days he rose from death. Without this, there would never be anything Christianity. That is the difference with other religion. I must say I am amazed by your look of things. Dishop Myles Preached Christ by preaching about the Kingdom that many have lost sight of and rather focused on other things. What makes you think he was a false teacher? He has never said people are made righteous or are saved by believing in Myles Munroe. He said when you come to the Kingdom (offcourse by believing in the finished works of Christ) you have not come to a man but to a Kingdom. Therefore have a kingdom oriented mindset. Many receive Christ and never really become ambassadors of the Kingdom because they are too afraid to faulter or because they are afraid of critics. If the Kingdom must be established here on earth(offcourse through ambassadors of the kingdom), But Bis Myles stood as a true representative(ambassador) of the Kingdom. We must have a kingdom mindset and be thus oriented. I believe that’s the message Bis Myles Munroe preached and that is not heresy. God is not the ONE to come here on earth and do this for the church. The church must rise up to the task. Remember Mat 28:18-20 ‘Go make ambassadors of the Kingdom in every nation…. teaching them to observe all that I have commanded you(teaching them to be true ambassadors) and lo I am with you even to the end. Atah I will refer you back to scripture. The same ones I have been posting on this post. Paul tells us what the gospel is. The gospel that was revealed to him by Jesus Christ Himself on the road to Damascus. Paul went further to say that if anyone preaches any other gospel let him be eternally condemned. Ask yourself the question; was the gospel that Myles Munroe preached the same as the one that Paul preached? Moreso what is your definition of the gospel? Did you take some time out to watch the video that started all these back and forth? I think we as Christians have the God given rights to judge what we hear. We should be like the Bereans and not just accept all teachings. Judge based on scripture and hold fast to what is true. Are you inferring that preaching the message of the death, burial and resurrection of Jesus Christ will not make ambassadors for the Kingdom? Instead of us teaching people to come to the God/man Jesus Christ, we are teaching people to come to what we can get from Him (Kingdom). True Christianity is the only ‘religion’ that is dependent on an individual. Every other religion teaches on rules and regulation to attain nevana but in Christianity it is all about Jesus Christ plus nothing. People just don’t get because they are religious. Growing up in the Apostolic faith, I used to always hear, You Must Be Born Again. But nobody ever completely explain what the Kingdom of God was in John 3:3-7. The Kingdom of God taught by Dr. Myles showed me that what I was taught wasn’t wrong, but incomplete. The Kingdom doesn’t take the focus off of Jesus, it just allows you to see who Jesus really is. Jesus saying seek first the Kingdom makes more sense when you see Jesus from the Kingdom of God perspective. People just don’t understand Dr. Myles. I pray through his death, people will start taking the Kingdom seriously. Perfectly sais Franklin I now rest my case so please let this man rest in peace. PST.CLAY LONGOI NGONDI, MOMBASA, KENYA. Jesus is the one who became God’s way of justification for man to get back under God’s authority, or from independent of God to dependant on God, or from an allien to being a citizen of God’s Kingdom. Many people, cultures and religion somehow unconsciously tend to recognise the existence of a supreme being in form of a ruler who demands submision. Be it in Hindu shrines, or the voodoos of Haiti, or the black magics of Africa or worship services in all forms of different religious temples whether Christians or Muslims. One thing is common, the recognition of one as a ruler and them as subjects asked to submit. So, the subject of King and Kingdom is not actually “News” to the world. What is news is about this one King who gave His only begotten Son so that ‘Whosoever’ believes in Him shall find FAVOR with this King and His Kingdom. And this is what Jesus instructed his disciples to take to the ends of the earth as “GOOD NEWS.” What He has done on behalf of all people in order for them to be restored to God’s Kingdom. It is good news in the sense that every creature does not need to do anything but only BELIEVE what the King’s Son, Jesus Christ, has done on your behalf and you will be accepted into this wonderful Kingdom not as a subject but as the son of the King! No wonder Jesus called it Good News. Ministers of the Gospel, lets keep it simple and it will simply be understood and believed. Personally, i respect Bis. Myles for his amazing contribution to the propagation of the gospel. It is not up to anyone to judge the kind of work he did. Lets leave that for the judgement seat of Christ where every man’s work will be tested in fire by non other than Jesus Himself. This is what Apostle Paul advises the Corinthians. It is so true; we don’t merely see things as they are, we see them as we are. Anyone who is bent on fault finding would find faults in basically anything. Its amazing that I have not heard anyone judge any famous person as ok. there is always something wrong with them. If you become successful you are just assumed to be evil. What a shame…it stinks of shameless jealousy. Anyone who condemns Myles is just too intimidated by the impact he has made…believe it or not Myles is very much alive with us. He died empty. No potential was unexploited. All critiques get used to that! I mean, Jesus also said to Peter that he would do even greater things than that of what was being done at the time. It would be absurd to think that the Word cannot meet someone in any position or walk of life and build you up from there. I totally agree with the stance you took on this issue mainly because the applications for the Word cover EVERY base of human existence and leads you to a “more glorious destiny” (Ps. 73:24). The difficulty of the Word is it’s simplicity. Who are the sons of God? Those who have the Spirit of God. The problem with today’s Christianity is it has become a ‘Common Sense Only’ christianity. People are no longer spiritual ( no longer in tune with the Holy Ghost). This is my argument: don’t just judge someone by what they’ve said and how they’ve said it, ALSO (and most importantly) Judge by the spirit by which they are speaking. It is easier to detect a false spirit than to detect a false teaching. Cuz demons can pretend to be angels of light, giving a slightly twisted truth or half true, or truth at first, then lies. A lady with evil spirit was following Paul n Other apostles declaring the gospel with them until they had enough of her n casted out her spirit. You see, the only way you would’ve known If Doctor Myles was a false teacher, was through the Holy Ghost. I’ve heard him many times, looked directly into his eyes through many live streams, I know by the Holy Ghost he belongs to Christ. He may not be perfect, but Discernment tells me he loved Jesus and had a burning desire to serve the citizens of God’s Kingdom . Misunderstood he maybe, but you shouldve known by the Holy Ghost that Dr. Myles belonged to Christ, if you truely belong to Christ yourself. Many belong to Christ only by their own confession n common sense, but are not in communion with the Holy Ghost. Does Jesus even knows you? If we are living by the Holy Spirit, this topic would not have arise in the first place. Christianity is dead without fellowship with God’s Holy Spirit. The man has done the work well, nothing like heresy anywhere but he preached revelation as god gave it to him. He is never in hell nor in heaven because there is re-arrangement going on in the spirit. You are going to see the conclusion of all things soon. The man preached the right message throughout, the kingdom of god. The kingdom of god is what is going to take over soon, god has completed the work in the spirit already. Calvary has completed it’s work and gone longtime ago, we have another set of power working for the new kingdom of god forever. You can check the 12 prophecies to the new world, new kingdom on my face-book and other social networks. So Munroe was dead wrong. Not to mention he has also preached that Christ “did not really die”. The man single-handedly nullified he crucifixion and leaves us (believers) in our sin. I have heard the man speak in person and he teaches a different gospel. He was a false teacher. His death was tragic, but ministry was profane. Keith, again, no one is suggesting we do not preach Jesus and him Crucified. Myles Munroe did not teaching that, neither am I suggesting it. That’s not a real objection. Someone sent me the clip about Myles Munroe preaching that Christ “Did Not Really die.” And that is NOT what He said at all. Here is the Clip that someone sent me. I have not seen the rest of this message, but I’ve seen many of his other messages where he clearly talks about Jesus Died. What you are failing to understand is that Myles Munroe is not talking about his belief, he’s talking about how the Bible records the death of Jesus. If you find the rest of that sermon, I’d love to see it in it’s full context. Where Myles Munroe got it wrong, is that the New Testament was written in Greek, not Hebrew. But again, because I do not have the full sermon, to know what he is referring to before and after this statement, I cannot say. He may in fact have been referencing a Hebrew Copy of the New Testament. Paul clearly states in I Cor. 15:3 what was given to him as of FIRST IMPORTANCE. This is not changed or nuanced in this or any other of Paul’s writings in the New Testament. Furthermore Paul declares that this truth was declared to him by the Holy Spirit. Therefore it is not subject to change or nuancing. Munroe relegated what the Holy Spirit said was of FIRST IMPORTANCE to no better than second place. Munroe is wrong. Furthermore, Munroe’s idea of the Kingdom of God is fraudulent. He sees the Kingdom as the place where we get all our stuff. the Kingdom of God is no less than Jesus Christ Himself. He is the one to be sought, He is our highest reward. When Jesus opened the Scriptures to the disciples on the road to Emmaus, he showed them how all the Law and the Prophets pointed to HIM. Munroe distorts that message. Paul states in this passage that he is delivering to them what he received as of FIRST IMPORTANCE. In no other place among his writings, nor those of the other New Testament writers, is that FIRST IMPORTANCE standing of that truth changed or contradicted. Furthermore, Paul received this truth from the Holy Spirit Himself, as all of his writing and teaching comes from Him. Therefore the truth is eternal and immutable. Furthermore, Munroe’s concept of the Kingdom of God is fraudulent. He presents the Kingdom as the realm where believers get all their stuff. Christ is the Kingdom, the Kingdom is Christ. It is in Him and Him alone that we live move and have our being. When Jesus opened the Scriptures to the disciples on the road to Emmaus, He explained how all the Law and the Prophets spoke of Him. He is our reward. We are gifts to Him from the Father. Munroe profanes the Kingdom of God making it the source of temporal blessings and the fulfillment of earthly desires. Please remember the context. According to Paul, he decided to speak nothing AMONG THE CORINTHIANS except Jesus Christ and Him Crucified, because they were Immature Babes in Christ (1 Corinthians 3:1). Later on in that same Chapter Paul Says this. So Again, if you are an immature babe in Christ, like the Corinthians, you need to have Jesus spelled out for you plainly, because immature believers lack discernment for real wisdom. If you are mature and wise, Paul spoke deep things about the Mystery and Union of God and Man. Paul went further in another letter to explain what that mystery was. “I have become its servant by the commission God gave me to present to you the word of God in its fullness— 26the mystery that has been kept hidden for ages and generations, but is now disclosed to the Lord’s people. 27To them God has chosen to make known among the Gentiles the glorious riches of this mystery, which is Christ in you, the hope of glory. Prescisely, and what unbeliever is any more mature in the things of God than even the Corinthians. They must be instructed in the thing of FIRST IMPORTANCE, Jesus Christ’s atoning work on the cross for sinners. Paying their debt of sin by His shed BLOOD on the cross and enduring the just wrath of God in their place. Munroe distorts the Gospel. False teacher. This gentleman is spot on . . .
Firstly, Gnosticism in it’s many variations was about Salvation by Secret Knowledge, in other words, if you don’t believe what I know, you’re not saved, in other words If you don’t believe what I consider Doctrine you are not saved. That is what the Christian Heresy Hunters are saying, that because someone else does not know what they know, they think that person is a heretic and going to hell. So Christians suggesting that Myles Munroe’s is going to hell, because of doctrine, means they believe in Salvation by what we know, which is the definition of Gnosticism. If you can’t see that, then there is nothing more I can say. 1. So he’s basically calling Paul’s method to the Athenians idiotic, and instead appeals to silence [what is not recorded] to make his point? If that makes sense to you, then I really don’t know what to say. We know very well that it is a condensed version of the sermon, but one cannot build any evidence from what is NOT recorded in the Bible. It’s true that Paul said additional things in that Sermon, but the fact is, those things are not recorded. At best, they are make for speculative ideas, but we cannot model anything on what is not said! No one alive to day knows exactly what Paul Said, and for that reason no one can use what is not recorded for evidence of anything. That would be like me pointing to the fact that there were things Jesus said but are not recorded, and then use that to say that Jesus preached Islam in those Unrecorded Messages, that were left out of the Bible. That’s exactly what people do with the missing gap of Jesus’ Life from when he was 12 to 30. Hindu’s claim he was in the far East, other claim he was studying Greek philosophers. The fact is, arguing from silence is fallacious and erroneous. Basically, when something is not recorded, you can say Anything! If you don’t see the obvious errors in this, there isn’t anything I can say to you. 2. The second point is a stray man at best. You cannot say the content of Paul’s Message to the Athenians disproves the Method that Myles Munroe uses for Evangelism. The content and the style are two different things. Saying that Paul’s Message doesn’t have the same language of the Kingdom, doesn’t negate the fact that what we have recorded, is the same style. 3. Paul appealed to their Culture, He used Pagan sources that they could relate to peak their interest, and never mentioned Jesus in that sermon. Myles Munroe does the same thing, except instead of using Pagan sources and culture, he talks about his understanding of the blessings of the new Covenant (which Paul does also about the forgiveness of our sins), to peak interest, before inviting people to know Jesus Christ. If you can’t see that the Method is the same, well I can’t help you. Lastly the third point, again, has no relevance than his own personal opinions. As the problem with so many Christians today, they do no realize that UNBELIEVERS do no understand Christian Terms, Christians Language and Christian Phrases. Christians value the Blood because we understand what it has done, but to unbelievers, the Blood doesn’t have the same value or reverence. Which is the entire point. Before someone can make the Blood valuable and precious in the eyes of an Unbeliever, you must tell them the Good News about what the Blood accomplished FIRST. If these arguments make sense to you, and is “spot on,” then it is no wonder you don’t understand Myles Munroe’s teaching or my article. You are free to believe what you want about Myles Munroe, but you’re in position to label him a false teacher or condemn him. This is where I think you got it wrong. You labeled me a gnostic because I quoted Paul’s teachings about the gospel. A teaching that main line Christianity has followed for thousands of years. Yet you talk about this new knowledge (gnosis) that Myles Munroe taught in the twentieth century. Myles Munroe has this new knowledge of converting unbelievers to believers which is by teaching them the kingdom knowledge first then once they understand the knowledge about the kindgom then and only then would you teach them about Jesus Christ. Who is the gnostic again? The Apostle to the gentiles, Paul, said that if anyone preaches a gospel other than the one he taught, that person will be eternally condemned. The Gospel IS THE GOOD NEWS. And the gospel that Paul preached was not a gospel about the kingdom but it was the message of the death, burial and resurrection of Jesus Christ. The gospel demands a response from each person, individually; Why did Jesus Christ die, why was He resurrected? This is what we need to be teaching unbelievers. Not just to believe in Jesus Christ but to answer the question, why did He die for you? Why was He resurrected? It is the answer to these questions that saves us. That is why Paul says that he is not ashamed of the gospel for it is the power of God for salvation to those who believe. The gospel, the good news, is that Jesus Christ died to take away the sin that Adam brought into this world and He was resurrected so that those who believe would have the LIFE that mankind lost when Adam sinned. This is the simple, basic message that has been taught for centuries. Myles Munroe came up with this new revelation knowledge that instead of that we should first teach people about the kingdom. Christianity is about a person and not what you can get. As sweet sounding as this message is, it teaches people to seek what God can give them instead of seeking Jesus Christ and Him alone. Someone commented that Myles Munroe preached what God revealed to him. I think this is where “milk drinking Christians” get it wrong. God is not revealing anything new to anyone. God’s complete and final revelation to mankind is Jesus Christ. The Holy Spirit of God is here to reveal Christ in us not to give us some new knowledge that no one since The Resurrection had. Keith the comments you made on ‘prayer’ giving reference to Trinity Broadcasting Network, 23 February 2000 and on the ‘nature of God’ giving reference to Trinity Broadcasting Network, 11 December 2000, and which are strongly supported by Roger, brings me and i think it should bring all of to one conclusion which is ‘Bis. Myles taught simple things which are hard for some to understand’. I now understand why Brook uses the term ‘ heresy hunters’ for truely there are. “Is there a God besides me? There is no Rock; I know not any . . .
Again this is not judging the man, Myles Munroe, but it is holding his teachings against scripture. The teachings are false. Ergo, Munroe was a false teacher. Keith the comments you made on ‘the nature of God’ giving the reference to Trinity Broadcasting Network, 11 December 2000 and also on ‘prayer’ giving reference to Trinity Broadcasting Network, 23 February 2000 and which are strongly supported by Roger brings me and i think it should for all of us, to one conclusion which is ‘Myles taught simple things which some find very hard to understand’. I now understand why Brook uses the term ‘heresy hunters’ for truely there are heresy hunters. The false doctrine shortcut that one may simply “allow Jesus into your heart” is arrogant and false and leads only to eternal damnation. Do not be fooled. Unless you hear and accept Gospel of Jesus Christ, the instruction carried forward by Peter and the Apostles and later Paul and seald within the Holy Bible, you CAN NOT see the need to repent and then be baptized the way that 3000 souls did on that first day of Pentecost. In rejecting Peter’s message you thus reject Jesus Christ as Lord and Savior over your life. You therefore have not had your sins washed away by Christ who preached and exemplified humility and obedience to God’s Word, presenting himself before a bewildered John the Baptist in order to be baptized the right way by the right person, in the right Spirit. The Holy Spirit does not therefore live in you for He cannot live where sin has not been washed away. The far reaches of what all these so-called preachers along with an earth-full of “churches” and religions have proclaimed by their own “wisdom” is all vast, deathly foolish emptiness since the Light of the Word of God exposes that they had never entered into God’s Kingdom in the first place. They ignore the map that leads to God’s Kingdom and are therefore, despite appearances, fumbling in the darkness that is the early stages of the terrible eternal damnation. Briggs why dangle a carrot infront of people before presenting Christ to them. Why not just give them the pure and simple message. Christ died because you were a sinner. The law that condemned you was nailed on the crossed with Him. He resurrected so that in Him you might have the LIFE of God that was lost in Adam. Christian maturity is growing in our knowledge of Jesus Christ, so that we are not tossed back and forth by the waves, and blown here and there by every wind of teaching and by the cunning and craftiness of people in their deceitful scheming. How can the lost know they are lost without a point of reference to be lost by? What use is a cure without first learning of the sickness? What use is a King without seeing his kingdom? Didn’t Jesus come first declaring the Kingdom, prior to his death? Didn’t Jesus tell us to seek first the Kingdom and it’s righteousness (which Dr Munroe states as meaning right standing with the King of that Kingdom)? Did he preach Christ died and resurrected and ascended (often forgot) for the salvation of the world, that they may enter into his Kingdom? (note the bible talks much of entering into the Kingdom – it talks much about the Kingdom of Heaven… in fact, it’s something being discussed a lot at the moment by many. I think this debate by the Heresy hunters and the Gnostics and even the defenders has been framed wrong, perhaps first look at the whole bible – the Old testament is littered with the imagery of the Kingdom, then compare Dr Munroe’s teachings with the bible, not until you understand the complete teachings of the Scriptures can you hope to compare. Secondly Church Orthodoxy would not technically have called Myles Munroe a heretic, perhaps a little hetrodox, but on the whole Orthodox. According to Myles, Jesus did not “really die, he expired…”. How does this quote juxtaposes with line seven of your defense treaties. I am no pastor, however I read in the Bible that after He cried it is finished, He, Jesus, hung His head and died”. Whose words am I supposed to believe? Myles or Holy writ. further, if Jesus did not die, then the whole plan of salvation is a myth. By the way, there are many more controversial posits that Myles argue, which calls into question Biblical teachings. To my mind, this is not good. The Bible and the Bible alone is the only rule of faith for the christian. Amen! Amen! Amen! Amen! NOTHING ELSE MATTERS BUT JESUS CHRIST! Let the man RIP people Please!! He was indeed a sober and upright Man of God! What’s your problem? Historical Church Orthodoxy would not technically have called Myles Munroe a heretic, perhaps a little heterodox, but on the whole Orthodox. Funny how all the Nay Sayers forget that they themselves are not perfect in their own personal revelation of God. Myles or anyone for that fact can give opinion to their revelation of Jesus Christ aside of what the basic foundation of the word of God is. The bottom line is Myles was a upright man of God. He was one of the many few I knew who lived a life he talked about. He stayed away from sin he was a virgin when he married his wife. He emphasized learning your purpose in Christ and YET, people love being complacent bored christians. Part of being a Christian is to gather information about a thing before making a decision, judgement, rebuke, or accusation. That’s what using wisdom is about. Myles Munroe wrote, taught, and preached extensively about the Kingdom of God, and about Jesus. Everything about the kingdom he preached and talked about was about its KING, JESUS. Apostle Paul taught the same message that Christ and the other apostles did, see (Acts 28:30-31; 20:25, and 28:23). A mistake some people make is to elevate the words of Paul above the words of Jesus. Pauls writings are epistles, letters written to address issues in churches where he has already preached the Kingdom message, while planting the congregations. To try and use Paul’s teachings as an argument against what Myles Munroe taught, is ridiculous. Myles Munroe focused on the gospel message that Jesus taught in the gospels, along with the overall understanding that the whole bible is a story about a King, and his Family. Pauls writings are scripture, and inspired (God breathed). Therefore they are on the same level as Jesus words. Amen! After this author said “while I am not familiar with much of his teachings or ministry” I couldn’t view this article credibly. It’s silly to argue against something that you haven’t researched, especially when Myles Munroe’s false teachings are easily accessible on YouTube. The Bible says we over coke by the blood of the lamb and the word of our testimony. Do we really draw The lost in by showing them a better life in Christ? It would look like he was right at the preaching, But he didn’t tell the truth – fully. That makes it a false doctrine. When he takes something away (Jesus) He should have mentioned what else will be filling the gap, Here Myles is taking Jesus away from the Kingdom. In a Kingdom – if I I like to get a citizenship, King is supreme. The Kingdom is the King. The kingdom is not a shoe shop or democratic! Myles confuses an elected government with Kingdom, where King is everything. Gospel is not in the power of who is telling, But Gospel itself has the power that if in the name if Jesus. If I say in Myles’s terms – Avoiding Jesus is like, selling a shoe without telling about how the shoe is better? Where is the greatness of the Gospel of the Kingdom without the qualities of the King? We can see how the listeners are relieved with a happy sigh! They are now happily be announcing the Kingdom of … oh wait, Kingdom of whom? In short – The intention of the Myless message is mainly to create a wave of shock and attract people. OR – His intention was to help people to tell the Gospel without any problems. Unfortunately, Jesus sent the disciples to the wolves, so we have NO WAY to take the pain out! A partially correct preaching is only fully wrong! In that way, he sounds much like a heresy rather than doctrinal. Unfortunately I assume you have never read any of Dr Munroes books. He makes it Abundantly clear that the King is Supreme, seek the Kingdom and with that his Righteousness. There is no separation, and hes trying to explain a concept of Kingdom that is foreign to the Western World. When you truly understand the depth of Kingdom, you will truly understand the majesty and awesomeness of our King Jesus Christ. Just my 2 cents as I have read a lot of his works. I suggest reading a book called the Divided Gospel by Dr Mattera. In these, last days, we so badly need to come together in one accord. Praying for each other to grow in wisdom and discernment instead of tearing each other down. I think we are unlikely to draw anyone to Him with this behavior. Should all the lost people not understand they are lost and in need of a savior before we offer them a better life? One other thought what if your life is going great? What if all is well and your not in need of Jesus making your life better? Judgement belongs to God, warnings from God is given to us. When a teacher davieates from the truth, it is heresy and can happen when a person is puffed up. Doctrines of devils can come from misinterpretations of the Bible in the most subtle of ways. Myles did seek to Tell us that the Door is the door – No, the Door is a person and not a means to an end. Heaven (Kingdom) and Earth may pass away but My words will not. How many times have you ever sang a worship song praising the Kingdom? He said, in my Father’s House are many mansions. It is a House, not a person. For it is said, of the increase of His Government there shall be no end. Not the government of the Kingdom, but the government of a Person – Jesus. When you try to toy with the tenets of our redemption, you are looking for serious trouble. To you readers, discern when heretical teachings are brought to you on a plate of gold. Careful what you allow to settle in your heart, for out of it are the issues of life. We are only foolish if we point at somebody and say something about anybody indicating that we cannot see our own problems first and saying any problems about somebody..if you judge you will be judged too…let God be the only judge. 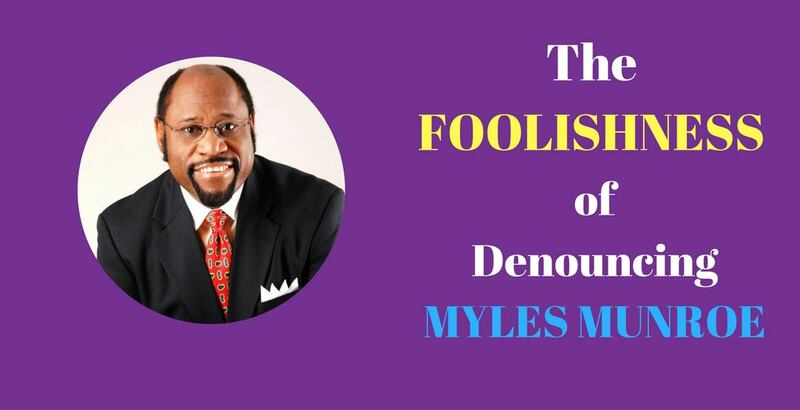 I believe too that it is foolishness to denounce the precious child of God Myles Munroe. We know those us who are blessed with his teachings. Over 30 years on one taught me the Kingdom of God. It is his videos that saved me from staying ignorant about the major plan of God for man to knowing the Kingdom of God. God bless Myles Munroe and his wife who are in heaven and his children and his ministries. To understand the teachings of Late Dr Myles Munroe, you need to remove your Lenses of Religion! It’s only Religious persons who use the word “Heretic!” Even Jesus was called a Heretic and that mentality comes from a “Holier than thou attitude” Pharisee attitude which is not of God! This is what makes Christianity of today a deadly and boring religion! Many have been killed in the name of Christianity! Jesus corrected this error in his disciples who found someone who was not of their group and tried to stop them. And Jesus asked them why they wanted to stop him. In other words, Jesus was happy that someone was preaching the Good News of the Kingdom! (Mark 9:38). Jesus Preached the Kingdom of God and its righteousness! He did not preach Christianity! To make a fair and righteous judgement of the Ministry of Myles Munroe, you must demonstrate that you have read all his books, seen all his videos and not just a clip. Once you do that, you will realize you have been fighting God’s servant, condemning a righteous man who did his best to preach the Kingdom of Heaven. Dr Myles Munroe was a genius, a Phylosopher, full of the Spirit of God, a husband of one wife who preached righteousness, who did not seek his own glory but making the glory of God known to man, a man who touched many souls with the word of God and helping Millions to discover and live their God-given potential! He preached Christ, The Kingdom and its righteousness! This message is only revealed to those that are humble to be taught! This is why Jesus rejoiced! He said Thank you Father that you have not revealed these things to the proud teachers of the Law who think they know everything, but you have revealed it to babies (Matthew 11:25)! Which cup is easy to fill? A full one or an empty one? Blessed are the poor in Spirit! The Good thing is the Servant of God is asleep awaiting the resurrection of the righteous! If you call yourself a Christian, humble yourself before God and don’t be Judgemental! Be open minded and learn more from the word of God! Judge Not! Grow in Truth and Grace! Let each one of us work our own Salvation we unto God, we’ll all be made answerable for every idle word we have spoken or written. If we have accused anyone falsely, we’ll be guilty before God of breaking His commandment: Thou Shall Not Bear False Witness Against Your Neighbour! (Matthew 19:18). If you call yourself a Christian, Stop this malicious smear campaign against the Late Dr Myles Munroe because you are already guilty of bearing False Witness against the great servant of God! God have mercy on your poor souls!